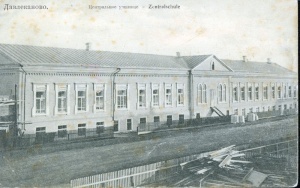 The Davlekanovo Zentralschule, in the Russian province of Ufa, opened in the fall of 1908. It was founded by the brothers K. G. and G. G. Neufeld. The former took charge of the administration and was its first principal and one of its first two teachers, while G. G. Neufeld organized a society for its financial support. The Davlekanovo Zentralschule was a new type of secondary school among the Mennonites of Russia. Although its curriculum was similar to that of other Mennonite Zentralschulen, it differed from them in the composition of its student body. All the other Zentralschulen had only boys as students, and girls attended separate schools. Before 1870 a few girls had been admitted, to the Zentralschulen, but then the school authorities and the Committee for Public Welfare (Fürsorgekomitee) prohibited this practice. This was thus the first truly coeducational Zentralschule in the history of Mennonite education in Russia. After a few years of operation this type of school was not only approved by the parents of its immediate constituency, but schools in other parts of the country followed its example. The Davlekanovo Zentralschule had students, Mennonite and Lutheran, from several parts of Russia, but chiefly from the provinces of Ufa and Samara and from Siberia. It had the usual four-year course, to which a teachers' training course was added. Since this school also had an elementary school connected with it, the teaching staff usually consisted of eight to ten teachers. Among these teachers were F. C. Thiessen, D. P. Enns, G. J. Gaede, and Karl Friedrichsen. J. P. Rogalsky was connected with this school from its very start until his departure to the United States in 1922. Rogalsky, J. P. "Davlekanovo Zentralschule (Ufa, Bashkortostan, Russia)." Global Anabaptist Mennonite Encyclopedia Online. 1956. Web. 18 Apr 2019. http://gameo.org/index.php?title=Davlekanovo_Zentralschule_(Ufa,_Bashkortostan,_Russia)&oldid=104848. Rogalsky, J. P. (1956). Davlekanovo Zentralschule (Ufa, Bashkortostan, Russia). Global Anabaptist Mennonite Encyclopedia Online. Retrieved 18 April 2019, from http://gameo.org/index.php?title=Davlekanovo_Zentralschule_(Ufa,_Bashkortostan,_Russia)&oldid=104848. Adapted by permission of Herald Press, Harrisonburg, Virginia, from Mennonite Encyclopedia, Vol. 2, pp. 20-21. All rights reserved. This page was last modified on 7 December 2013, at 14:13.